A new center at Wright State University’s Lake Campus designed to house its fast-growing agriculture program and strengthen its water quality research is a step closer to reality. Ground was broken for the Agriculture and Water Quality Center on May 31. The project is expected to be completed by the winter of 2018. The 8,190-square-foot-center center, which includes a 680-square-foot portico, will be built east of Dwyer Hall. The cost of the project, approximately $3 million, is being bankrolled with $1.5 million in state funds allocated by State Rep. Keith Faber and the rest is being raised by Wright State. In 2008, Lake Campus began offering agricultural elective courses that were part of existing degree programs. In response to the desire to build an agriculture program to meet the needs of the community, Lake Campus in the past several years created numerous certificates and degrees in agriculture and food systems management. Today, more than 50 students are enrolled in agriculture and food science programs. Courses include topics such as animal science, animal health, nutrient management and agriculture finance. 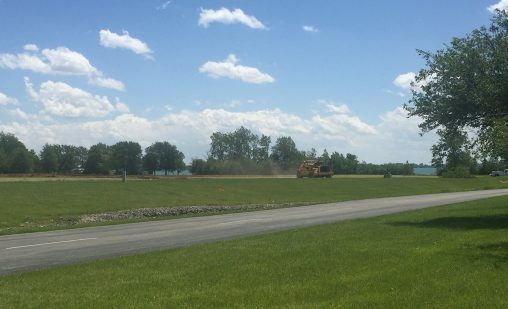 Work began on May 31 to prepare for construction of the Agriculture and Water Quality Center at Lake Campus.